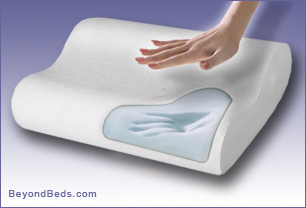 by Sleep and Comfort Products Corp.
Aerus Natural memory foam is an open-cell highly breathable foam with 8x's greater air flow than traditional memory foam. This means a cooler night sleep for you! This environmentally friendly " green" Contour Pillow is manufactured using plant-based renewable raw materials, replacing portions of the petroleum-based polyols used in manufacturing most memory foam pillows. Memory foam was first developed for NASA to cushion and support astronauts from the intense pull of gravity during launch. Aerus Natural memory foam is produced using (VPF) Variable Pressure Foaming, a patented, virtually zero-emissions manufacturing process.The contour shape supports your head and neck, and is comfortable in all sleeping positions. Sizes and Dimensions: Standard (15 x 21 ) Queen (15 x 28 ) King (15 x 32 ) Pillow height is 3 on bottom 4 on top. Warranty: 3 year limited from the original purchase date. Made in USA.